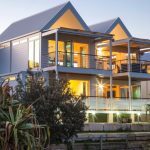 Regal retreats, home to Mistere Retreat’s luxury accommodation on Kangaroo Island and Murwillumbah also offer top level accommodation overlooking the beach at Kingscliff at Regal Retreat’s Pacific Sunrise. This classic Hamptons style beachfront home channels the elegance of luxury brands with its flashes of fine art and sophisticated elegance. There are three spacious bedroom suites and two cabana style junior suites, a Mediaroom and library, a gym, and an in-ground heated plunge pool. Topped off with spectacular ocean views and access to over eight kilometres of beachfront, a walking and a bike trail, this luxury home is perfect for families and friends to enjoy a relaxing beach holiday in northern NSW. Nestled in a prestigious residential area for the utmost privacy, all your needs have been anticipated in this impeccably designed villa with temperature controlled heating, reverse cycle air-conditioning and a state of the art music and media system. Whether you’re a beginner who wants to try surfing for the first time in a one to one setting, a group of girls or guys celebrating or an experienced surfer who wants to advance to the next level this is for you. Their professional, expert surf instructors are trained to work with people of all ages and skill levels. Every instructor is hand selected and goes through an intensive training program. Instructors are also certified in CPR and First Aid, so you can feel assured that you are getting the best surf training in the world. You can schedule a private lesson just for yourself or with a small group of friends or family members. It’s great fun to take a lesson with your kids, friends or Hens Party. If you are competing in a surfing contest, we can also provide one-on-one coaching with one of our head instructors to help you prepare. Let us help you take your surfing to the next level. Experience the natural beauty of the Tweed Valley with Mount Warning Tours, on the Spirit of Wollumbin, a traditional Huon Pine River ferry. You will glide slowly upstream on the majestic Tweed River and/or the scenic Rous River whilst taking in the scenic river and mountain views. Beautiful Wollumbin Mount Warning, the heart of an ancient volcano, is best seen from the vantage point of the Tweed Valley waterways. The Tweed River that runs through the heart of the valley, links Murwillumbah’s Heritage Trail, galleries, museum, studios, cafes and coffee shops with the Tumbulgum Heritage Trail at the historical meeting place of the waters. Departure times: 10.30am every Saturday, (other days on demand) and as scheduled via website booking engine. Other times for group bookings on request. The coffee and tea culture is abundant in this idyllic climate. Start the day by learning all about coffee and how to make the perfect espresso. Lunch is sure to surprise in Murwillumbah with its growing chic café culture. Enjoy lunch at one of the local restaurants before heading to Madura Tea for a tour of this iconic tea plantation. Finish the day at Paper Daisy in Halcyon House for a final tasting of coffee or tea with a twist. Who needs wine? The Northern Rivers is home to two of the best craft Distillers of Gin and Rum in Australia, as well as craft breweries of all sizes. Join this tour for a day of tasting as you visit Cape Byron Distillery – home to the award winning Brookies Gin, and get a chance to taste the best from Husk Distillery – the home to Ink! Gin and Husk Rum, as well as a tasting tour of Stone and Wood. Enjoy the day as you pair Gin, Rum, Beer and Cider with local delicacies, right in the heart of where they are made. Wednesday is market day in Murwillumbah. Start the morning with an array of delicious French Pastries and coffee before heading to markets to sample local produce & meet the farmers. From here, journey into the heart of the Tweed and to the base of Mt Warning for a tour of the gardens of Mavis’s Kitchen, followed by a tasting plate of their signature dishes. After lunch enjoy a stunning drive through farmland and sugarcane to the Tweed Regional Gallery and Margaret Olley Art Centre, for a tour of the latest exhibitions accompanied with afternoon tea overlooking the majestic Tweed Valley. Accommodation at Regal Retreats Pacific Sunrise starts from $465 per night. Regal Retreats is a wholly Australian owned and operated company that is focussed on the high-value, eco-tourism and leisure market. Formed in 2014 it has been established by Andrew MacDonald with environmentally conscious principles in mind and a desire to link people with the natural world. By creating a real connection with nature it is a core belief that a sustainable future is created – as only when someone appreciates something and understands it do they truly want to protect it for everyone’s future. Each Mistere property under the Regal Retreats brand has been individually curated in environments that are at the same time, accessible yet private and tranquil. The serenity of seclusion is available in each location close to the comforts of civilisation. Whether it is Urliup – outside of Murwillumbah, Nepean Bay on Kangaroo Island, Crescent Bay near Port Arthur or Kingscliff in the Tweed Valley, all Mistere properties are within easy driving distance of an airport and major tourist centres are close by. Another key aspect of the Mistere eco-retreat and Lodge collection is the use of Art and where possible – monumental art. Art on a scale and in a form so as not to be overwhelmed by the location or the surrounding environment. Art mostly sourced from local Australian artists but also global in reach with world-class pieces individually chosen by the owner – some whimsical and some more serious – but all captivating. Art that will inspire and heighten the senses providing more memories to share and a desire to create. A visit to Mistere on Kangaroo Island is one never to be forgotten. Forest bathing in Urliup, bonding with miniature farm animals on Kangaroo Island or luxuriating in Kingscliff while whale watching – each is a unique masterpiece magnified.